I'm joining in with The Blended Blog where they're asking questions about spring today. 1. What three colors remind you most of spring? Turquoise blue, coral, and bright white. Especially combined, these colors feel so springy to me. I also love blush pink, but I like it just as much in the winter. 2. What is the first thing you add to your wardrobe in spring? As far as switching from winter to spring, I start switching my heavy coat for lighter jackets as soon as I can. When it comes to what I buy in the spring, I usually buy some new shoes to start the season. 3. What is the first wardrobe item you ditch in spring? Usually my heavy coat and thick sweaters and cardigans are the first things to go this time of year. Even if it's cold enough to wear them, I'd rather layer up than wear my heaviest sweaters again. Sometimes I also shift my wardrobe based on color and put away things I consider to look like fall and winter--shades of burgundy, rust orange, and mustard yellow. However I don't have any hard and fast rules about colors and seasons, it just depends on how I feel. 4. Who mows the grass where you live? My husband mows our grass. Thanks Aaron! 5. What's spring like where you live? I live in Kansas, right near Kansas City, Missouri, and spring gets mixed up with winter pretty regularly here. It usually starts out pretty chilly with random nice days mixed in (this weekend was a prime example, with weather nearing 60 on Saturday then 30 and sleeting yesterday). Usually by the end of April and into May, mornings are still cool but it gets warm by afternoon. We usually get a lot of rain this time of year too. 6. What's your favorite thing about spring? Spring is my favorite season so it's hard to pick just one thing I love about it! My birthday is at the end of April, so that's up there. It's hard to clearly define, but I love the feeling that I get when the nice days are more regular and being outside becomes a pleasant experience. I love knowing that winter is finally over. Also, I love being able to eat outside, I think spring is the perfect time for that. 7. Are you a spring cleaner? No. I wish I were. I mean, I do clean our house, but I don't do a big "spring clean". I feel like I do that more in the summer when our schedules are more relaxed. But honestly I hate cleaning so I have to force myself to do it no matter what time of year it is; I don't feel a desire or drive to do it. I just do it because it has to get done. 8. Are you a baseball fan? Yes, my whole family (well, not sure yet about Violet) loves watching the Kansas City Royals! We are hoping to visit all the US baseball stadiums as a family, and try to plan a summer trip around a ballpark visit. We're just getting started so have only been to Busch Stadium in St. Louis and Target Field in Minneapolis. This summer I think we're going to see the Texas Rangers in Dallas. Tickets are expensive, but we also try to go to games at our own Kauffman Stadium when we can. Jona especially loves to watch the games. 9. Tulips or daffodils? Both are pretty, but tulips say spring to me. 10. 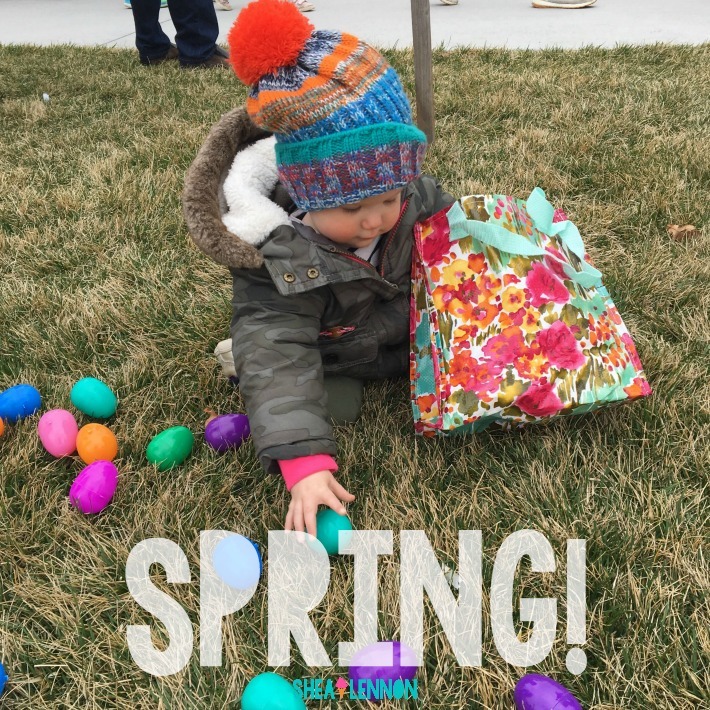 Favorite outdoor spring activity? It's a tie between eating dinner outside and going to baseball games. It's also nice to go to friends' houses (or have them over at our house) and let our kids run around outside while we just sit in lawn chairs and chat. 11. Flowers in the ground or in pots? I'm a fan of either. If it's a plant and I haven't killed it yet I'm totally winning. We are hoping to give our front yard a much-needed makeover, and I hope it will include both! Aaron will be in charge of plant-care, of course. 12. Favorite bird? I've never really thought about it before; I can't say I have a favorite. 13. Car wash or wash vehicles at home? My poor car is lucky to get either one of those on a regular basis, honestly. I prefer the natural thunderstorm wash, ha! But it is nice to get that car-wash clean shine when I can. I remember going to the car wash as a kid and thinking it was so cool, but the last time I took Jona through one, last spring or summer, he was afraid of it! 14. When do you pull out your sandals? Whichever comes first, when the weather starts getting warm (like 60s and up) consistently or when I finally get, or more likely, give myself, a pedicure.